As we grow older we have a tendency to romanticize the past and view it through rose colored lenses as greater than it actually was. This is even heightened, it seems, when it comes to competition, especially in the sports realm. You can talk to old timers that were former greats in any professional sport and the older generation of fans who grew up idolizing them and they will always feel that their era was superior no matter what, it is just the way it is. This phenomenon seems to be much stronger when it comes to former professional basketball players, a prideful bunch, and comes out often as the 24/7 sports media cycle is obsessed with comparing great players and eras (a very difficult thing to really do) for page clicks or views. Many people are discussing whether this current Golden State Warriors team is the best basketball team (save the original Dream Team) ever assembled, and that has caused great players like Michael Jordan, Charles Barkley, Scottie Pippen and now Magic Johnson to puff out their chest and proclaim that they are not. That’s right, he thinks his “Showtime” era Lakers would sweep the Warriors because of their size difference. That is ridiculous and a scary thought for the man tasked with saving the Lakers organization, considering that shows he is still stuck in the old school mindset of needing a traditional center to truly be great. Here is a news flash for you Magic: Kevin Durant has sometimes been playing at center in this series and is doing it a lot better than Kareem was in the mid to late 1980s. While these comparisons are impossible, if hypothetically, Magic’s Lakers and the 2017 Warriors played in a series with today’s rules, I honestly think the Warriors would win the series. 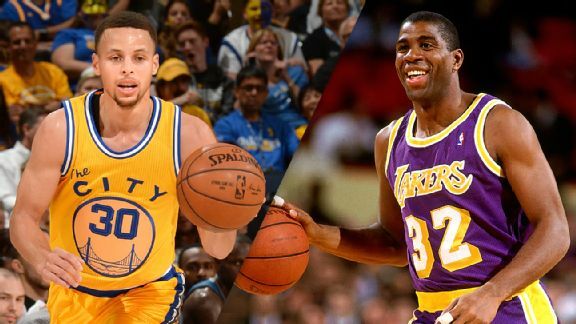 It would be close, because Magic’s team would actually fare well in today’s NBA (unlike the late 90s Bulls) and Kareem would present some issues on the offensive end, while being a liability on defense guarding the Warriors. These fun but somewhat useless barbershop or water cooler conversations will always persist in the NBA, but like anything else in life, technology, social consciousness (maybe not right now) medicine, knowledge of how to properly maximize your athletic gifts, etc. things progress and improve over time and basketball is no different. The 1980s era of basketball was a great one and it saved the NBA, but there weren’t 10 John Wall’s and Russell Westbrook’s flying around and their damn sure wasn’t a LeBron James, Kevin Durant, or Greek Freak taking the league to a whole new level athletically.